At street level the building housing the jazz club is nondescript. It’s in a row of gray warehouses and commercial buildings that sit with blank stares at the thoroughfare they front. Step inside and the jazz club is transformative. Over the years, the jazz music has created its own deep burnished patina that feels welcoming and right with the world. Tonight the solid-brass ceiling-mount lights cast soft golden light. The candles in cut-glass holders are lit and look like fireflies spread throughout the club as their flames flicker. The trio of musicians, dressed in dark suits, sip drinks at the bar with its blacklight blue glow. The stage is arranged the way they like it. People are filtering in—all hip, handsome, and beautifully forlorn. They will fill the club and become one with the whirlwind of life in jazz. Regina, a striking Czech model confidently walks in and sensually joins a table near the stage. Most just feel her aura—a tingling sensation of aroused energy—without knowing or caring what causes it. The all-knowing Cool Jazz Cat is in his hidden corner of the club when the trio—bass, piano and drums—starts. I sit just outside the inky shadow where the Cat resides hoping to learn from his observations. The jazz group slides into Duke Ellington’s Prelude to a Kiss, then Horace Silver’s The St. Vitus Dance, and then some Bud Powell, including There Will Never Be Another You. The trio demonstrates a command of mood with subtle shifts that undulate and maintain the jazz cool. The bass player leads the crowd through the terrain. The Cool Jazz Cat slips me a note on an all-Cotton blend Crane & Co. paper mill notecard. Respecting the music, he communicates through his handwritten notes. 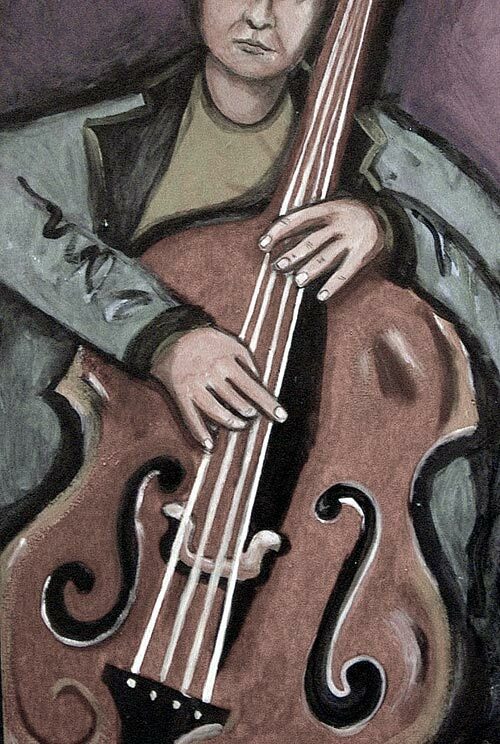 In his precise lettering he says: A woman could be as lucky to be played as well as the double bass. There’s a sense of affection and abandon in the bass player’s playing. His arms engulf the upright like a lover and hands are all over the strings with urgency and passion. Listen close… there is the occasional soft moan of pleasure…. but one can’t discern if it’s coming from the musician or his bass. This entry was posted in Jeffrey Winke and tagged Chronicles of the Cool Jazz Cat: Maintaining the Jazz Cool, Jeffrey Winke, Poetry by Monsieur K.. Bookmark the permalink.